A crown is ‘cap’ that resembles your tooth and can help strengthen a tooth with a large filling when there isn’t enough tooth remaining to hold the filling. Crowns can also be used to attach bridges, protect a weak tooth from breaking, or restore strength to one that’s already broken. Crowns are also used to cover discolored and misshapen teeth or even a poorly done dental implant. Most dental procedure look like dental procedures and don’t often take into account aesthetic appeal or a natural look. At Soft Touch Dentistry, Dr. Bella Normatov’s objective is to provide her patients with the highest quality oral care, while maintaining a natural, aesthetically appealing look. She looks to ensure that her patients leave with a brighter, more beautiful smile as well as improved overall dental health. Dental Crowns do exactly that. They are an essential part of restorative dentistry, at the same time provide patients with a better-looking smile. Dr. Normatov prefers the use of CEREC porcelain crowns, considered to be the most beautiful crowns as well as the strongest and most durable. Natural look: porcelain’s semi-translucent look provides for the closest match to real teeth, in terms of look and feel. 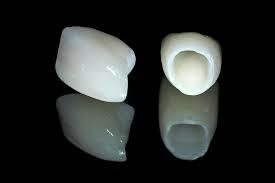 Perfect match: Porcelain can be shaped and altered to match pretty much any shape, texture, or color of your teeth. Durability: Dental grade porcelain is quite strong and lasts up to 15 years, with proper up-keep. Functionality: Custom-made crowns can cover the entirety of the damaged tooth and fit perfectly with your other teeth. Chewing food and speaking clearly should not be any issue with porcelain crowns. The porcelain crown acts as a protective cap over your tooth, restoring its size and shape while protecting it. In many cases dental crowns can be used to hold in place a dental bridge, and cover the abutment of a dental implant. Porcelain crowns allow for the best protection of your teeth as well as the best overall cosmetic enhancement. During your examination, Dr. Normatov will check your teeth and prep them for the crowns. Using dental putty, an impression is them made of your teeth and used to construct your custom-made crowns. In the interim, temporary crowns are placed over your teeth. At the next appointment, the temporary crowns are replaced with the custom porcelain ones. They are then polished and buffed, your “bite” is checked to ensure a proper fit. Adjustments are made if needed, and your crown procedure is complete.